Waterfront beach home with large private beach, beautiful view of the mountains and river. Chef's kitchen with open concept dining/living room with a gas fireplace and 70” T.V. with Satellite and Netflix. There is plenty of seating on the main deck that also faces the river that features a gas BBQ. There are four bedrooms. The master bedroom features a king bed, gas fireplace and its own private deck facing the river, an ensuite with shower, 2 person jet tub, and double sinks. Two other bedrooms with Queen beds with cheater bathrooms, one of the bedrooms have two kiddie corvette beds. The fourth bedroom has a double bed and is on the main floor next to a powder bathroom. We also have a sofa bed in the family room and there are two queen size air mattresses. An outside hot tub, kayak, fire pit and some outside toys for guests to use. We have a two-seater kayak, a one-seater kayak and a paddle board with plenty of lifejackets. We are located 20 minutes to Kanata and 40 minutes to downtown Ottawa.We are pet friendly for well-behaved pets and must be disclosed. PRIMARY RENTER MUST DISCLOSE ALL GUESTS & VISITORS, FEES WILL APPLY FOR EXTRA PEOPLE. This is not a wild party is perfect for get-together's, showers, reunions, family gatherings and small events for under 80 people. LGBTQ friendly. All venues are an extra cost! We will work closely with you on your special occasion. Please email for details. Check-in during the weekday is anytime after 5:00 p.m., weekends 2:00 p.m. Check-out is noon. Please fill out the rental policy attached when booking and send to the email address on the form. We were born & raised in Canada's Capital and are proud of our so much to do! We are easy going laid back people. We enjoy working hard running our businesses and dabbing in real estate. We have invested a lot of time and energy building our beautiful home which we would like to share with you! We want nothing more than for every guest to leave 100% satisfied with their stay & will go above and beyond to make it happen. Great for family gatherings, family reunions, showers, romantic getaway's, small events. The beautiful white sandy beach is privately owned. There are three private acres of property, 700 feet waterfront. End of the street, very quiet, beautiful view of the river and mountains from 50' deck. Located in Constance Bay. 12 guests maximum, 4 bedrooms, sofa bed, 2 kiddie beds, inflatable beds, 3.5 bathrooms. Beautiful view of the mountains and Ottawa River, with our own beach. 8 seats in dining area, 3 stools at counter area and more chairs are available as well. 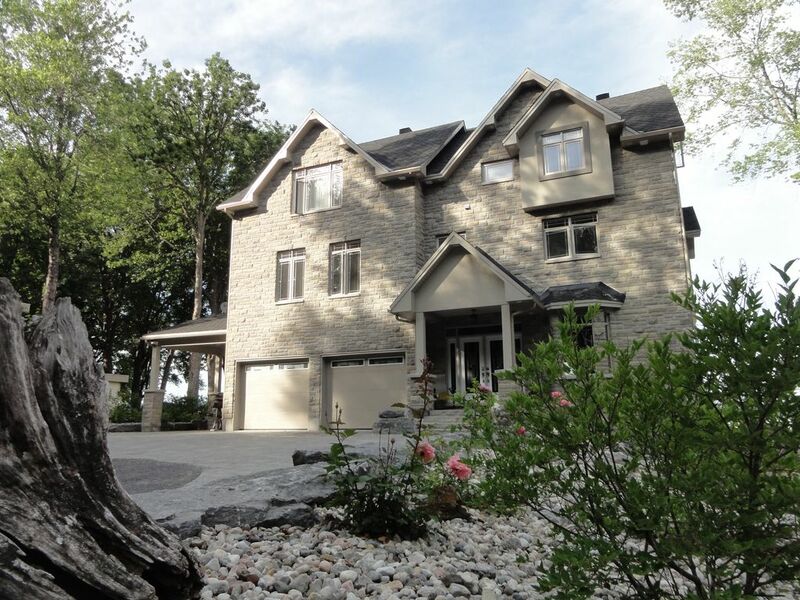 Honestly one of the best properties you can find in the Ottawa area. This is the second time I've stayed at West Beach Villa and both times I've been nothing less than thrilled. Checkin is easy, the house is well stocked, the amenities are gorgeous, the place is spotless, the views are spectacular and the beds are comfortable. I'll be a perennial guest here so long as they keep having me back! We were attending a wedding in Ottawa and stayed there with my whole family. My daughter and her husband and two kids, my son and his wife and a kid and my son with his friend. We through a party the day before wedding with my family (about 30 guests). The house was so big and open that everyone loved it and we didn't feel it was crowded at all. The kitchen was the best part. Anything you can need is there. For this house just bring your clothes. Although it was a little bit of drive to Ottawa and the wedding place but we didn't mind at all because we stayed home most of time and went to the wedding and back. We love this place and we will be back. My girlfriends and I stayed for the weekend and it was perfect. Outdoor space is great for young kids. Couldn't swim at the beach, but the kids searched for shells, caught frogs and played soccer in the yard. We had some great fires at the beach as well. Constance Bay point was just a few minute drive down the road and there was a playground at Len Purcell Community Centre about 5min away. Sharon our host was helpful and checked in with us part way through the trip to make sure we had what we needed. The place was well equipped, we had more than what we needed. Such a beautiful place, you won't be disappointed. This house is amazing!, It has everything you could possibly need, The owners Kevin and Sharon were very easy to get in touch with if you had any questions. I used this for a team building retreat and it could not have been better. Kevin and Sharon we're great hosts who communicated promptly. The property is stunning, immaculate, and roomy. I will definitely be back many more times! We rented this house for a girls weekend and it was perfect. The house itself is huge, and has everything that you need. We used the kyaks, paddle board, fire pit and of course the hot tub. Sharon is great and very welcoming. I would recommend this house to anyone, you won't be disappointed.